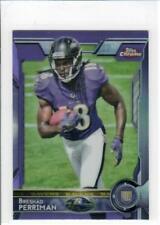 2015 Topps Chrome MINI FB #197 Breshad Perriman ULTRA RARE PURPLE REFRACTOR RC!! All cards are NM-MT or better. IF THERE HAPPENS TO BE MORE THAN ONE IN THE PICTURE, THE ONE IN THE TITLE ONLY. Breshad Perriman 2015 Leather And Laces National Treasures Card. 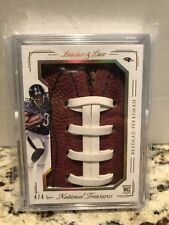 Breshad Perriman 4/4 2015 Leather And Laces National Treasures Card. Please make payment within 72 hours of listing end. Card will securely ship within 48 hours and include an eBay provided tracking number. I combine shipping charges for up to (2) additional items at no charge so check out my other listings. I only accept Pay Pal and No International bidders please. Upon winning multiple listings, please request an invoice reflecting combine shipping. This Card in my opinion is worthy of grading. I feel that it would do quite well if sent in however it is currently NOT GRADED nor am I any type of grading expert so please judge condition prior to purchase. Message me with any questions or if you need more pics as I'm quite responsive. Thanks for looking! Card was pack pulled and right into toploader. Please see photos of the card you will be receiving. All cards are Mint to Near mint condition unless otherwise noted. Please email me with any questions you may have and I'll respond asap. Thanks for looking and please check out my other auctions! 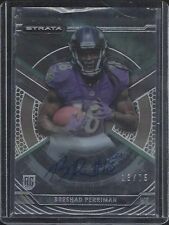 2015 Panini Immaculate Breshad Perriman Auto/Patch * 1 of 1 * . Condition is Like New. Shipped with USPS First Class Package. 2015 Panini Contenders Draft Picks Breshad Perriman. Item # G-130. Buyer will receive the exact card that is pictured. Card is in excellent condition and has been in a sleeve. Smoke-free home. Sleeves or Toploaders may have sharpie, stickers, or tape on them. THE ABOVE LISTED CARDS IS IN NR/MT CONDITION. 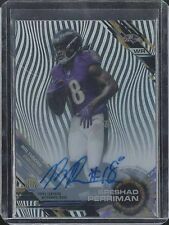 This is for a 2015 TOPP HIGH TEK ROOKIE AUTO # 84 BRESHAD PERRIMAN Rc. Very nice card.